Three of the least likely angels ever created are called upon by the Lord to serve as the new Holy Trinity when he realizes that the world has changed so much that the original three, archangels Michael, Gabriel and Raphael can't do it all by themselves. Death Angel 666, has seen far too much in his scant lifetime that he doesn't want to be an angel anymore. The matter is driven home when he witnesses a young child get accidently shot and he can do nothing to save him. Six's sorrow is felt by every young angel created in the last thirty years. 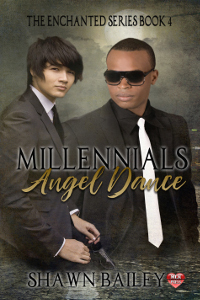 These angels are known as the Millennials, and when Six unintentionally invokes the Angel Dance, they all come to help him out. Does this mean the End of Days are near? Or will Six, and his new partners, Jaelyn and Gracien be enough to stop it?